I’m sure you already have at least one turtleneck and create various outfit with it from casual to office ones. 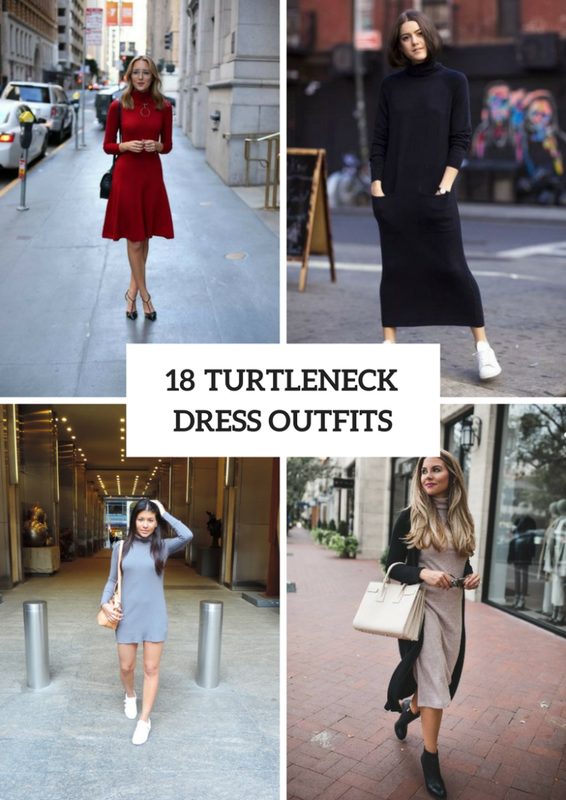 And today I want to show you some stylish and feminine look ideas with turtleneck dresses that will be perfect additions to any fall outfits too. First of all, you need to choose a length (mini, knee-length, midi or maxi ones) and a type of dress (for example, it can be a fitted, loose, skater, sleeveless one). Secondly, think about prints and colors, and you should know that mostly women choose a monophonic dress (such as gray, black, brown or marsala ones) or striped one. And, thirdly, start to combine your new dress with other pieces of clothes, accessories and shoes. Below you can find some ideas. If you have over the knee boots and love mini dresses, then you should follow the next fashion advice. Just take a dark gray turtleneck mini dress and mix it with black suede over the knee heeled boots, a beige leather bag and sunglasses, and voila — a gorgeous casual outfit is ready! You can also change a classic bag to a chain strap crossbody mini bag and add a wide brim hat. If you want something elegant and chic, then try to repeat a look with a red or marsala skater knee-length turtleneck dress, a black bag, a golden chain necklace and black ankle strap pumps. Or put on a black lace skirt or dress under a light blue oversized long turtleneck and pair them with a black tote and heeled boots. For colder fall days you can choose a maxi turtleneck dress with big pockets and combine it with white sneakers. Or take a marsala mini dress and mix it with a black mini coat, black tights and black flat ankle boots.